1965's "A Charlie Brown Christmas" has been a classic childhood holiday staple for over five decades. 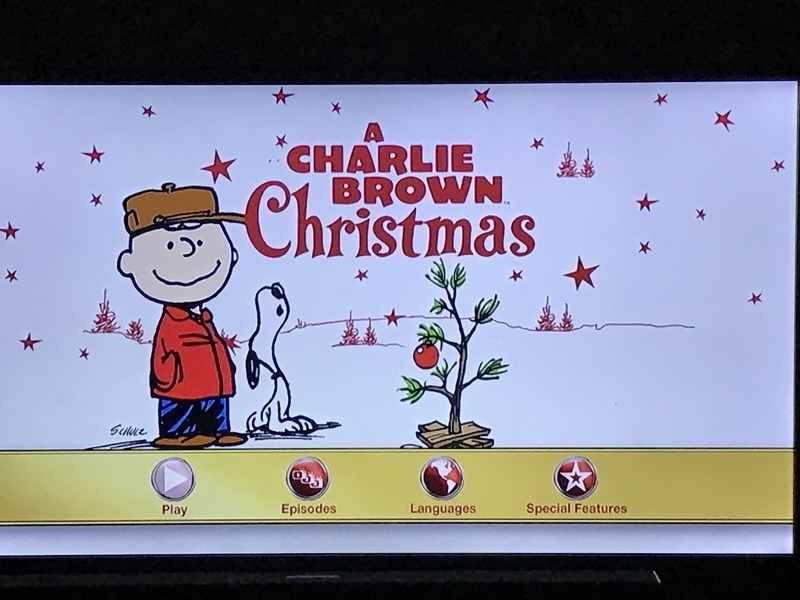 Whenever I'd tell people that I've never seen "A Charlie Brown Christmas," shock would take over their faces. Then their voices would lower. "You've never seen it?" they would whisper in hushed tones, clearly aghast by the mind-boggling information I've just given them. I could see it in their eyes and read their minds: To them, I lived the most deprived childhood possible. My friend Neil from the YouTube channel "IWALVG" (I Will Always Love Video Games) found himself in the opposite situation. He had never seen "Die Hard." Of course, most 9-year-olds probably aren't going to be watching that like I was. Still, it's now decades later and we both had a gaping hole to fill in our respective pursuits of cinematic Christmastime cheer. He still hadn't seen "Die Hard" and I'd never seen "A Charlie Brown Christmas." Well, Neil lived up to his end of the bargain. Now it was my turn. 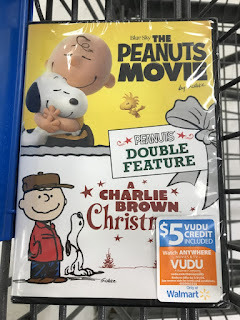 I found the movie in a double-feature DVD with "The Peanuts Movie" for $9 at Walmart. A $5 VUDU digital movie code knocked the price down even further in my mind. Other than a very lucky Goodwill find, it was never going to get any cheaper than this. It was either now or never. As soon as I pressed the "Play" button, I was instantly charmed by "A Charlie Brown Christmas." It tells a very simple – but powerful – story. Charlie Brown has become depressed by the over-commercialization of Christmas. Lucy needs someone to direct the school's Christmas play. She recognizes that Charlie Brown needs a project to sink his teeth into. They agree to help each other out. Will Charlie Brown rediscover the joy of Christmas? We all know the answer to that, of course. 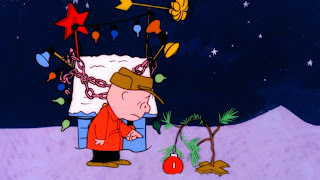 One of Charlie Brown's tasks is finding the perfect Christmas tree for the play. Even people who have never seen "A Charlie Brown Christmas" – such as me, before now – know about "the Charlie Brown tree." It's famous outside the movie. It may be a tiny, wilted, shedding, pathetic little tree – but Charlie Brown sees something special in it that nobody else does. Will everyone else eventually see the tree the way Charlie Brown does? Again, we all know the answer to that. There's a scene with Linus reciting a Bible passage that he says demonstrates the true meaning of Christmas. Something like that would probably never be allowed today. Believe it or not, it was frowned upon for different reasons back then. According to the DVD extra "A Christmas Miracle: The Making of A Charlie Brown Christmas," it was suggested to "Peanuts" creator Charles M. Schulz that comic strips were "too crass" for Biblical verses. Schulz took offense, and rightfully so, because he was a tremendously gifted storyteller whose medium of choice just happened to be the unique art form of comic strips. There was nothing lowbrow about what he was doing with Charlie Brown, Lucy, Snoopy, and the gang. The beauty of "A Charlie Brown Christmas" is in its stark simplicity. 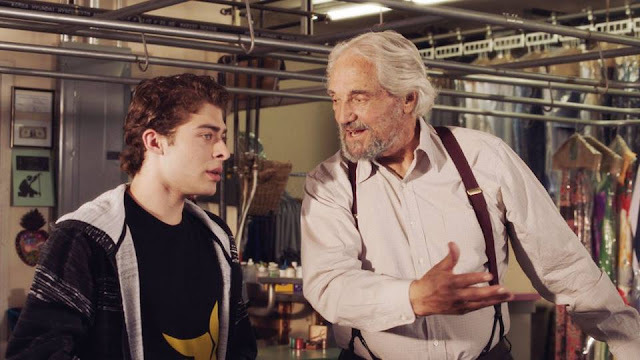 In only 25 minutes, it tells a wonderful story and fills its viewers with the cozy warmth of Christmas. It took almost three decades for Charlie Brown to finally appear in another Christmas special: 1992's "It's Christmastime Again, Charlie Brown." The Peanuts gang's return to Christmas is entertaining enough, but it lacks the magic, powerful storytelling, and emotional wallop of the original. It tends to meander on a bit, unlike the more focused "A Charlie Brown Christmas." It works as a double feature with the original, but it's unlikely to stand the test of the time the way the 1965 classic has.